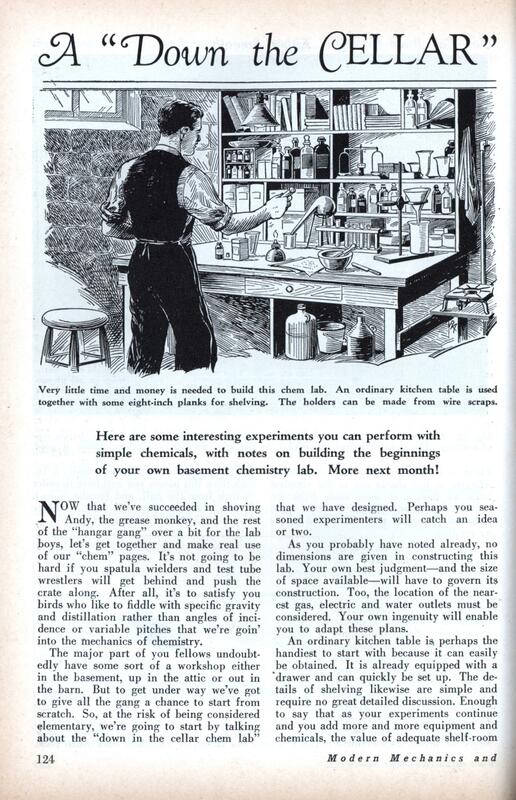 Here are some interesting experiments you can perform with simple chemicals, with notes on building the beginnings of your own basement chemistry lab. More next month! NOW that we’ve succeeded in shoving Andy, the grease monkey, and the rest of the “hangar gang” over a bit for the lab boys, let’s get together and make real use of our “chem” pages. It’s not going to be hard if you spatula wielders and test tube wrestlers will get behind and push the crate along. After all, it’s to satisfy you birds who like to fiddle with specific gravity and distillation rather than angles of incidence or variable pitches that we’re goin’ into the mechanics of chemistry. that we have designed. Perhaps you seasoned experimenters will catch an idea or two. As you probably have noted already, no dimensions are given in constructing this lab. Your own best judgment—and the size of space available—will have to govern its construction. Too, the location of the nearest gas, electric and water outlets must be considered. Your own ingenuity will enable you to adapt these plans. An ordinary kitchen table is perhaps the handiest to start with because it can easily be obtained. It is already equipped with a “drawer and can quickly be set up. The details of shelving likewise are simple and require no great detailed discussion. Enough to say that as your experiments continue and you add more and more equipment and chemicals, the value of adequate shelf-room will be appreciated. They may look empty for a while, but Oh Boy, when you get going! Much of the testing and mixing equipment must be purchased. If you’re on good terms with the local druggist you can get him to order much of your stuff wholesale. Then—you can make a lot of it yourself. Take the centrifuge. In recent years this piece of apparatus has saved much time in separating liquids of different specific gravity from each other and solids from liquids when they are held in suspension in such a way that they cannot be filtered. What formerly required days is now done in a very few minutes. This you can make from an old phonograph. By extending the pin that holds the playing disc and equipping it with a double cross-arm that has slots for test tubes at all four ends you’ve got the finest centrifuge in the world. Wind ‘er up, throw the switch and she is off while you’re doing something else. Although the number of revolutions per minute is not as great as electrically operated machines, it will serve every requirement of the cellar chemist. A piece of marble can easily be obtained from any junk-shop. This serves well as an ideal mixing board for pasty materials. Bottles, too, can be salvaged from the heap in sizes to meet every need. The same holds true with corks, wire for test tube holders and scraps of pure metals for lab work and analysis. The illustrations show how you can make your own alcohol lamp. Among the equipment that you will have to buy are graduates calibrated in cubic centimeters, spatulas, mortars and pestles, glass tubing for stirring rods and droppers, funnels, scales, test tubes, filter paper, litmus papers, thermometer, hydrometer and a gas or electric hot-plate. To this should be added a pair or two of rubber gloves for working with acids and a good, substantial rubber apron. A number of good books on chemical experimentation, too, are not amiss for in them will be found much of interest and value. The question of what chemicals and preparations to purchase is a difficult one to answer in this limited space. When it is considered that the average pharmacopeia contains more than 25,000 chemical preparations to which additions are made almost daily, we can be pardoned our wish to refrain from specifically stating that you should have this or that acid, powder or liquid. As we continue in our monthly rambles we’ll have plenty of opportunity of adding to the chemical end of our lab. One thing in chemistry that is always interesting is the large number of tricks you can perform. Take the case of glowing pictures. They can easily be made by drawing a picture on white paper with a solution of 40 parts saltpeter and 20 parts of gum arabic in 40 parts of warm water. An ordi- nary pen is used and all lines should be connected. Extend one line out to the edge of the sheet and mark the spot where it runs off with a light pencil. When a burning match is held to this spot the design— formerly invisible—begins to glow and appear in brown. There is another little stunt that will make a permanent display for your living room. It’s a chemical garden and simple to make. Prepare a small jar full of cold, saturated solution of Glauber’s salts and into the liquid suspend a kidney bean and a non-porous marble, stone or piece of glass by means of silk threads. Cover the jar and in a few days small crystals of sulphate of sodium will be seen radiating from the bean increasing it in size and giving it the appearance of a sea urchin. The non-porous body will remain unchanged. An explanation of this stunt states that the bean appears to have a special partiality for the crystals, which is due to the absorption of water by the bean, but not the salt. In this way a supersaturated solution is formed in the immediate neighborhood of the bean and the crystals, in forming, attach themselves to its surface. A good “weather vane” can be made from white blotters saturated in a solution of one ounce of cobalt chloride, half ounce sodium chloride, 75 grains of calcium chloride, quarter ounce of acacia and three ounces of water and left to dry. The amount of moisture in the air is roughly indicated by the changing color of the blotters. Rain is denoted by a rose-red tint, lavender-blue bespeaks dry weather and a bluish-red announces a change in weather conditions. Speaking about the weather, here is a handy little weather glass that is even more accurate than the papers. Dissolve 2-1/2 drachms of camphor in 11 drachms of alcohol and 38 grains each of saltpeter and sal ammoniac in ‘9 drachms of water. After mixing the two solutions pour them into test tubes and cork them airtight—or better yet, draw out the tube until only a pin hole remains. If you use the corking method run a red-hot wire through the corks so that you will have a very small hole about the size of a pin. When the camphor appears soft and powdery and almost fills the tube you can expect rain and south or southwest winds. When the substance is crystalline expect fine weather with winds from the north, northeast or northwest. When only a portion crystallizes on the side of the glass, wind can be expected from that direction. During fine weather the substance remains clear and at the bottom of the tube. When the substance begins to rise and a small star can be seen swimming around in the liquid you can be sure that rain is on the way. How to start your very own meth lab down in the cellar at home. Terry » I knew that was coming. I know it was an easy target, but couldn’t resist. Now, would anyone these days call someone as an “Spatula wielder” or a “Test tube wrestler”? I had a couple of books similar to this article when I was a kid. 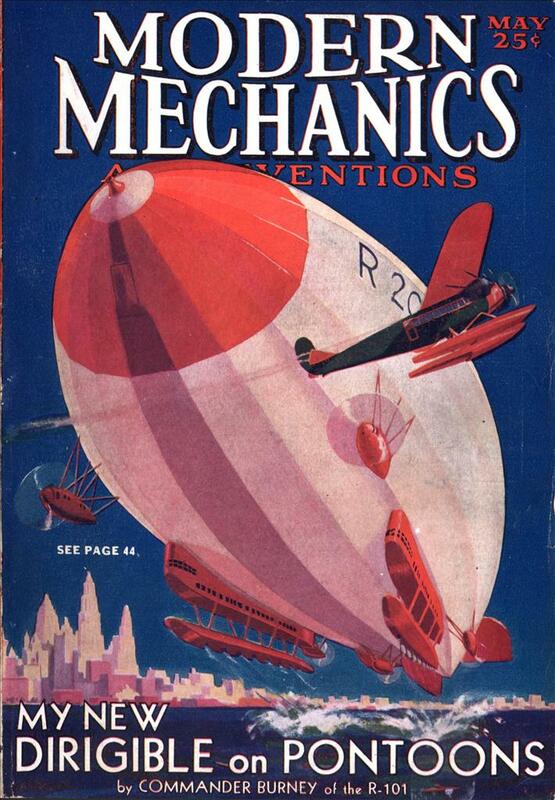 One was published by “Gold Key” and had some really funky experiments but was quite well grounded on the equipment side. It’s odd my parents would never buy my a chem set by would let me make a spirit lamp and make my own glass instruments (bending, tapering, flaring, etc.) I must have lost all my fingerprints to semi-molten glass at one time or another, but got quite good at it eventually. Uh, “Christoph”? Those “parentheses” that you “think” you see aren’t. Sorry people, but last I heard “these” are still quotation marks and (these) are parentheses. Toronto, was that the infamous (supposedly banned) Golden Book of Chemistry? http://chemistry.about…. George – yes, that looks like it. The link appears to be gone however. Toronto » Try the link on this page http://chemistry.about…. They apparently have hotlinking blocked. It’s not a real lab without a Tesla coil and a hunchback.